In 1985, Ronald Regan was President, cell phones were so big they had to be carried in a case with a handle and A young Italian Singer, Madonna Louise Ciccone, gave us a number one album for 3 weeks in a row in February. Fax machines and photo copiers were just coming into their own and many senior officers were skeptical of the idea of their agencies converting data onto some mysterious computer. No Internet or DNA and fingerprints had to be matched by the human eye. Also in 1985, a group of police officers who all shared a common Italian-American heritage came together with an idea which would provide the mechanism to develop a fellowship and share the pride they had, both in their profession and in their heritage, with the many other equally proud Italian-American police officers located throughout New Jersey. A lot happens over 25 years, as a group we’ve mourned the passing of many good friends, we’ve also celebrated many joyous occasions such as births, promotions, anniversary’s, among others, and we’ve had the true pleasure of making many, many new friends over those years. We’ve joined together in solidarity as a band of brothers whenever one of ours suffered a loss, an illness or simply needed assistance. And most importantly, we’ve maintained our strong family of united friendship throughout those many years of good times and bad. And we have grown, and continue to grow, as the largest ethnic fraternal organization in the State of New Jersey. As we celebrate our 25th Anniversary, what better time to go back and revisit our beginnings and memorialize our history as an organization. 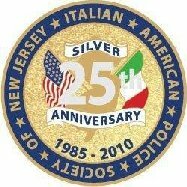 Following is a brief overview of the early days of the Italian American Police Society of New Jersey. To insure accuracy the article is based on interviews, records and photographs from several of our founding/charter members. In 1985 a small group of Italian American police officers from the Bergen County Sheriff’s Office formed a fraternal organization which they incorporated as the “Police Columbus Society of Bergen County”. This organization was to eventually become the forerunner of the Italian American Police Society of New Jersey. The Police Columbus Society of Bergen County had a rough start and began to falter after a couple of years. Coincidently, by that time a young corrections officer of Italian American decent was looking for an organization in the law enforcement community that celebrated our heritage. As he stated, “ I looked around and saw all these other ethnic organizations supporting their members and there was nothing for out there for Italian American police.” That officer, William Schievella, arranged a meeting with a representative of the Bergen County organization. As it happened, Schievella discovered that they were about to disband their organization and drop their charter, whereupon he offered to purchase their charter with the intention of rebuilding the organization. Who would have thought at that time that this foresight would be the seed that would grow into our current 4000 plus member organization. Following some lengthy negotiations involving Schievella and Larry Donato, who was to become the first Vice President of our organization, the Charter was purchased and transferred for a mere $50.00 (sought of like buying Manhattan from the Native Americans) and the name was immediately changed to the now familiar “ Italian American Police Society of New Jersey”. Once the Charter was formally transferred a small group of officers began to meet to in their homes and restaurants to plan and develop this new organization. The initial group consisted of Schievella, Donato, Mark Fiume, the initial Treasurer, and Chris and Nick Valiante, our first two Trustees. The first organizational planning meetings were held at Lacibeles Restaurant in Lyndhurst, as well as at Schievella’s parents (Dr. Daniel and Marilyn Schievella) home in Leonia. The group, realizing the potential of the organization, reached out to NYPD Sergeant John Rainieri, who at that time was the President of the NYPD Columbia Association. Sgt. Rainieri was instrumental in providing invaluable guidance and support during our early days and continued on as a mentor for many years. Unfortunately, Sgt. Rainieri has since passed. Every year the IAPSNJ awards one Scholarship in his name at our annual Scholarship and Awards Breakfast in appreciation of his many efforts on our behalf, and to this day the NYPD Columbia Association still remains among our closest friends and allies. The first official membership meeting of the now Italian American Police Society o New Jersey was held at the Roma Restaurant at 33 Crystal Street in Lyndhurst. Since there was no internet in those days the Board sent out teletypes, letters to PBA and FOP delegates, and word of mouth to promote the meeting and the new organization. Now, it was wait and see who attended. The meeting date arrived and so did a snowstorm. Surprisingly, approximately 50 potential members showed up, many of whom are still active members and several are still on the Executive Board today. Among those early attendees were our(then) current Executive V.P., Al Sierchio, Rocco Nisivoccia, a very active and important member in the early years who also has a Scholarship presented in honor of his name every year, Buddy Giangeruso, Robert Andreano, who brought along a contingency from the Passaic County Sheriff’s Department and John Occhiuzzo. For the first three years of the IAPSNJ all monthly meetings were held at that same Roma Restaurant. Planning meeting were also frequently held at the home of Al and Lucille Sierchio, parents of the (then) current Executive V.P, Al Sierchio. Usually these planning sessions included some good advice from Al’s father who has always served as a great advisor for our organization and some good food from Al’s mother. Word spread and the meetings and membership continued to surge with over 1000 members signing up during our first 18 months. It was late 1989 or early 1990 that it was decided to move the meeting from location to location to provide all members an opportunity to attend. The first meeting outside of Roma’s was at Puccini’s Restaurant in Jersey City. By then our meeting locations were being published in both the PBA and FOP newsletters, mailings to members, representatives at conference meetings and mini-conventions. Word had spread and the organization continued to grow. Many of our mailings, letterhead and courtesy cards were done compliments of then Morris County Sheriff’s Officer Dominick Gallo. Considering our numerous functions, charity events, meetings, dinners, etc. it was difficult to determine what and where our first organizational function was held. After some detective work it was determined that our first function was most likely held in Riverside County Park in Lyndhurst where early members simply gathered for a organizational picnic. There was no charge and members brought along their own food and drink and were simply there to enjoy each other's company and mutual interest in the organization. Our first really formal function, which was initiated by Executive V.P. Al Sierchio, was our first Dinner Dance which was held at the Fiesta in Wood-Ridge on October 24, 1992. Our honorees were actor, Tony LoBianco, Dr. Nicholas Ricculli of Morristown Memorial and Ace Alagna, Publisher of the Italian Tribune. Lt. Rocco Nisivoccia of the Essex County Prosecutor’s Office served as the Master of Ceremonies. 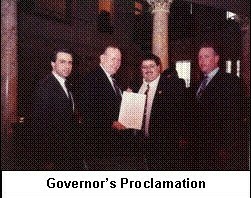 In 1992, James Arena, who was at that time the Director of Traffic Highway Safety, and unofficially the point man for Governor James Florio as a liaison to the New Jersey Italian American community, had developed an interest in our organization. Mr. Arena agreed to meet with Bill Schievella to discuss our organizations official standing within the State. That relationship led to further meetings with the late Senator John P. Scott (R) who assisted in pushing along legislation whereby our Society would receive official recognition by the State. Governor James J. Florio, (D 1990-1994) who was the first Italian American Governor in New Jersey, shortly thereafter signed a Governor’s Proclamation in 1993 fully giving the Italian American Police Society of New Jersey that recognition under law. By 1993 our organization still continued to blossom and was well on it’s way to becoming the largest ethnic police organization as well as the largest Italian American organization of any kind in the State of New Jersey. In that same year we held our first Annual Family Scholarship and Awards Brunch where we provided $10,000 in scholarships to deserving children of our membership, which we continue to do annually to this date. Senators Louis Kosco (R) and John P. Scott ® and Assemblymen Paul DiGaetano (R) and the late John V. Kelly (R) was passed by a Senate vote of 39 to 1, with the only no vote coming from Senator Henry P. McNamara (R). This Bill, which was signed into law, provided our members with time off with pay to attend our annual Convention. During that same period our organization was also instrumental in the development of the first two Columbus Day Parades in Bergen and Morris County. Our commitments and involvement in various charitable ventures also continued to increase as the years progressed. We have became Platinum supporters of the New Jersey Special Olympics with many of our members very actively involved in various fund raising activities for that cause, including but not limited to “Pasta Night” and assisting at the annual Special Olympic Games. We continue to run our annual Christmas Party for Big Brothers and Sisters which continues to grow in size and popularity every year, we’ve delivered toys to needy children unfortunate enough to be hospitalized over the holiday season, supported Deborah Hospital with our Night at the Races, as well as many other local charities. We are obviously very proud of our first 25 years and the many achievements and precedents we have accomplished during that time. It is rewarding to know that despite a new generation of young officers, significant cultural changes, technological advances and the changing political atmosphere over these many years we still remain intact as a strong and supportive law enforcement family of shared values, goals and beliefs whose commitment to our members and to our heritage has never waned. That will be our proud legacy. It should be interesting to see what the next 25 years will bring.